Interested in sprucing up your yard? Contact us today and we will be glad to provide our landscape design expertise to help bring your oasis to life. From all types of stone work to wood creation of decks and fencing. Whether it be our annual Spring/Fall Cleaning routine or our affordable lawn maintenance there isn’t a job too small or large for Green Acres. Give us a call today for a free quote! We can provide consultation! Our certified horticulturist and landscaping technician with decades of experience that can help guide you to design and achieve the yard of your dreams. With over two decades of experience within the interlocking stone industry we will provide you with professional, quality workmanship from start to finish. Turning our customers’ dream yard into reality, we are proud to offer a wide variety of interlock steps, interlock walls, interlock walkways, and interlock driveways. Whatever the job, we will surely be interested in providing our expertise. Check out our Landscaping Portfolio for further information and image galleries of work we have done in the past. Thank you to our loyal customers throughout the years for supporting Green Acres Greenhouses and Landscaping. As of 2019, we are no longer providing retail greenhouse services. We are continuing to provide support for large wholesale and large orders. Please call us at (613) 283-6423 to see how we can help facilitate your plants and gardening needs. Call ahead and order up a dozen of our extremely popular Gladiolus! 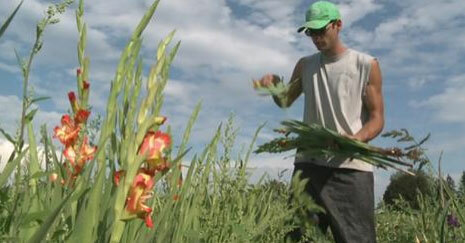 Check out our Gladiolus segment on the local CTV News Regional Contact!